Abu Dhabi has taken historical decision to introduced Hindi as 3rd Language of their Country. according to Census of Abu Dhabi on population their are 2/3rd people belongs to Indian Country. And from many year Indian citizen demanding to includes Hindi as Native languages. So from now onwards 11 February 2019. Hindi to become third language of Abhu Dhabi Court which rules under Arab Islamic System. In many cases Abu Dhabi Court system for foreigners is based on English in all civil and Commercial Cases Lodged in Abu dhabhi. 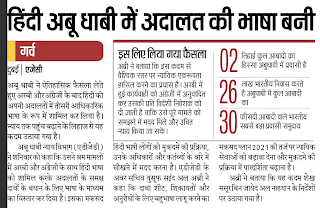 So it will give relief to those Hindi Speaking from Uttar pradesh, bihar, MP, Rajasthan to hire Hindi Speaking Advocates in Varanasi, Hindi Judges etc. Below are important point on UAE/Abu Dhabi that my be asked in SSC GD Constable, Banking and other State, Central Government department. 1. UAE/Abu Dhabi have 2 Official languages 1. Arabic, 2. English and 3rd is Hindi. 2. Abu Dhabi Judicial Department Approves hindi as Third Official/Native Language. 3. 2/3rd Population of Abu dhabi is from India. 5. Multilanguage/bilangual litigation system, the first phase of which was launched in November 2018.